So, it's finally here. On Saturday, we arrived at around 11:30am at the Abilities Centre. It was already packed! The volunteers were hard at work collecting donations and keeping things neat. The Auxiliary Police were there keeping people from parking where ever they wanted. There was a designated area for those with accessible parking permits AND they didn't let foodies take over the parking lot for those who were there to use the gym. Keeping hungry people in line is not easy for these volunteers and police, but they did a great job! It had only been open for half an hour and I still waited in line for an hour! It was worth it. I was 'lucky' that they asked me to wait a few minutes while they caught up on orders before they took mine. Lucky because we got to chat! These people are awesome. Even under pressure, they were still happy to be there and assured me it was worth the wait. They came to Whitby all the way from Hamilton and everyone was glad they did. Since the wait was so long, everyone I was in line with abandon me. Everyone ordered a different sandwich and we were all impressed. These aren't made of your regular bread you get at the grocery store. They were a slice and a half in size. This bread was fresh, buttered and grilled like a grilled cheese should be. These people are pros. We ordered the Lumberjack, the Sarducci and the O.G. 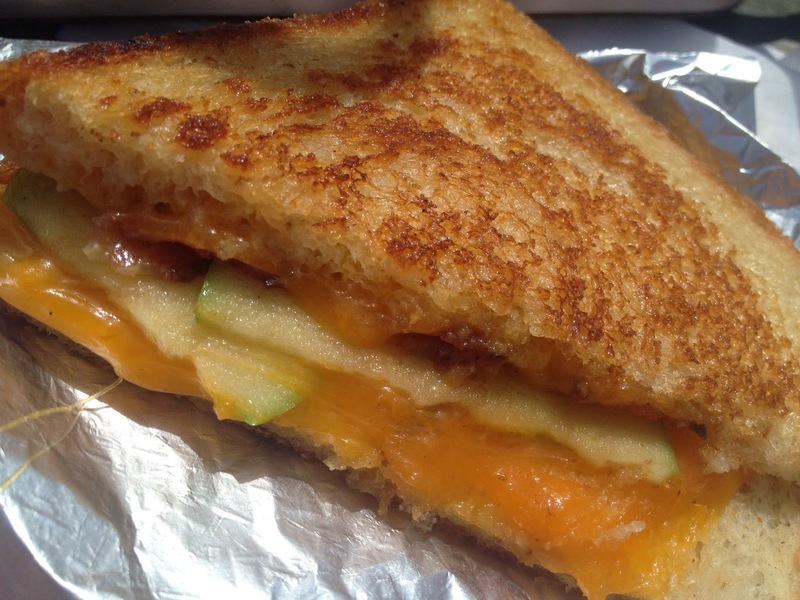 The Lumberjack had cheese, maple syrup bacon and sliced granny smith apple. These 3 things should always be together. The tang of the apple and the sweetness of the bacon with the gooey cheese made this a winner. The Sarducci had red onion, balsamic, cheese, tomato and basil. My mom was surprised at how sweet it was. The sweetness of the onion was buffered by that delicious cheese on multigrain bread. Mmmmmm. The O.G. is the classic grilled cheese. No fuss, just straight up. Enough to satisfy adults and the fussiest of 3 year olds. It was great to meet them and finally get the try their food! I look forward to trying more! 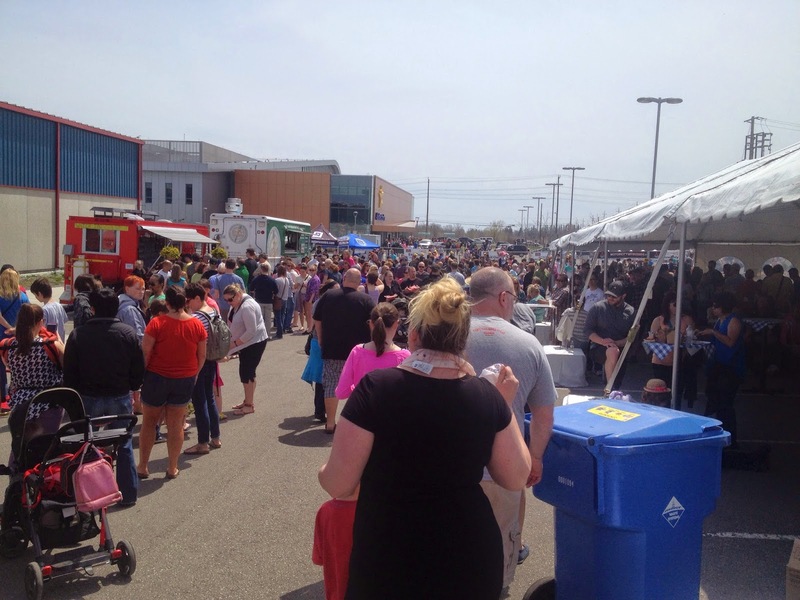 It was Sunday afternoon and many of the food trucks didn't anticipate the crowd. At this point, a few had run out of their star eats. Frankie's had run out of Arancini, the bocconcini stuffed rice balls. I saw everyone with them on Saturday too! I definitely missed out! My boyfriend and I went with the Ossobuco Gnocchi Poutine. Being Italian, I didn't know what to expect from it. CAN you deep fry gnocchi? Yes, yes you can. 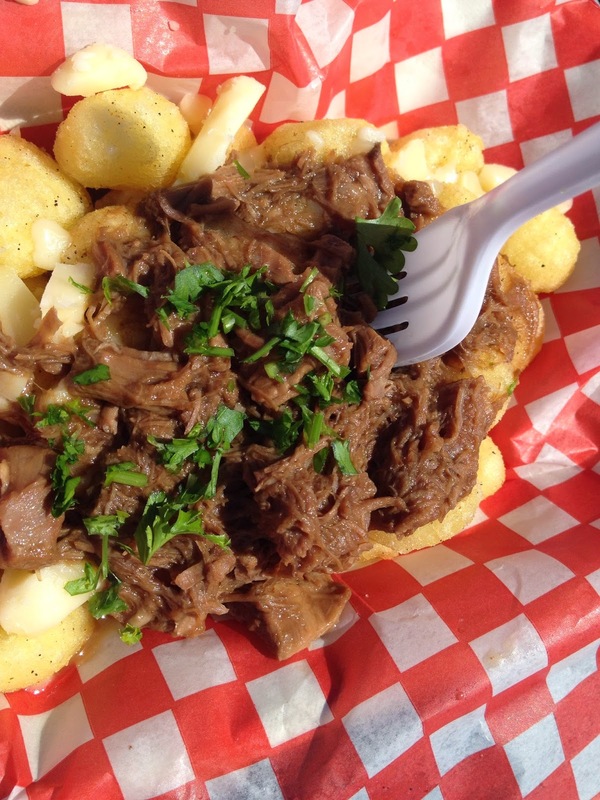 The crispy gnocchi were coated in cheese curds and smothered in braised veal. What a combination. The gnocchi were not heavy, like others I've tried. They were lighter and absolutely deep fry-able. The veal melted in your mouth. Instead of gravy the jus from the veal did the trick. If you told me I'd be eating a gnocchi poutine last week, I would've said you were crazy. I wish I'd got to try the arancini! GRR! We can't leave without dessert, can we? 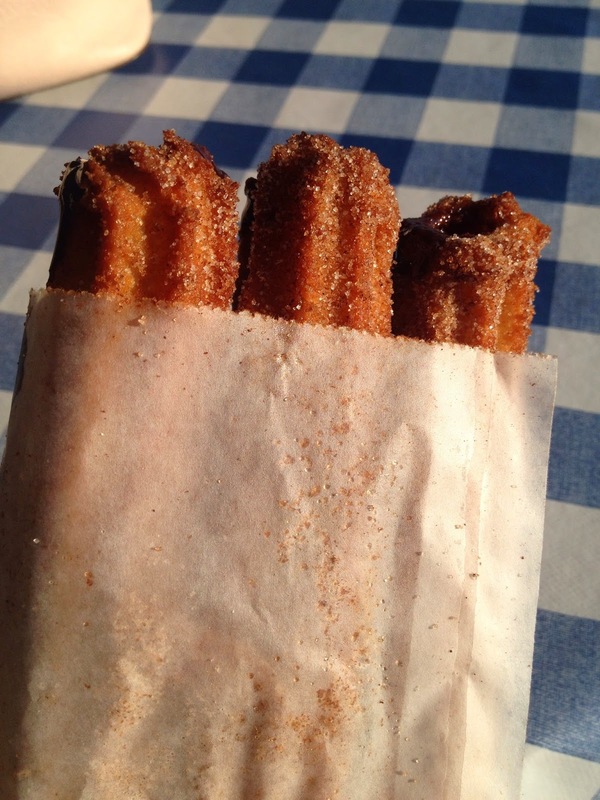 On Saturday, these yummy churros were in the hands of every adult and child. I had to find out why. These are efficient people. Assuming the prep and cook time is shorter for these delectable desserts, they rocked it. You walk up, order how many you want, pay, they hand them to you and that's it. Boom. They had them packed and ready to go. They were still warm, so you know they were fresh. This event was BUSY, so you know they weren't sitting there long! You could see the cooks inside working their butts off to get these ready. I had mine filled with chocolate sauce. No regrets. They were crisp, warm and coated in sugary cinnamon goodness. Not too sweet, there was a good balance; it definitely did the trick! I'm so happy this event came to Whitby. Durham Region doesn't get many food festivals other than Ribfest, so I understand why it was so hectic. We were clearly pumped! Only a few things I hope change if this event returns. The stage. I felt terrible for the performers. They were stuck in between trucks on a stage that looked like a rotary booth. The stage should've been in a better location with tables in front to attract an audience. The only audience they had was from a line up. It would've had a more festival feel if the music was centralized. Some food trucks had their own music playing, so you couldn't hear the musicians. The location/set up could've been better. For the amount of food trucks, the area was fine. The line ups were all over the place. You really had to watch where you were waiting because you could be in the wrong line and not know. The second day looked more organized with lines, but it could be that there were less people. Chalk lines denoting which truck the line was for would've made it go a little smoother. Drinks. The alcohol selection was great, great wines, great beers. Other than that, you could have water. I understand it's a charity event, so drinks would be a little pricy, but it was a bit much. The trucks weren't allowed to sell drinks, but there was no pop or juice to purchase from the rotary. All in all a great weekend. I'd love to thank all of the food trucks for coming out to Durham and supporting the Rotary Club. I wish I could've tried them all!